The international maritime sector will gather from 12 to 14 February 2019 at WORLD MARITIME WEEK, at Bilbao Exhibition Centre. Over three days, top representatives will discuss the sector's most important issues in four fields: naval, fishing, ports and energy. So far, shipowners and shipyards from 30 countries -France, Greece, United Arab Emirates, Poland, Singapore, Indonesia and Malaysia, to name a few- have confirmed their attendance at the B2B programme, and there will also be a congress and an exhibiting area. “The interaction between sectors represents a great opportunity, so the programme for direct contact with other professionals is one of the most valued spaces. Last year over 30 international shipyards and shipowners attended Sinaval, and our exhibitors held around 500 B2B meetings. In the next edition there will be 40, so the possibilities increase even further”, explains Sergio Alart, Director of World Maritime Week, who also highlights the value of the renewable energy B2B programme organised by Enterprise Europe Network. In this sense, Alart confirmed that the agreement with Meet The Buyer, a company specialised in the management of this type of meeting, has been renewed. Juan Riva, President of the Suardiaz Group. It is not long now until the maritime congress starts. The Luxua hall has been fully booked for weeks, with more than 100 exhibiting firms. Some of the participants include the main Spanish shipyards, auxiliary industry companies and organisations from the sector. The programme at World Maritime Week starts every day at 9am with talks open to all by our guests, and they will end at 2.30pm. After these talks there will be a private cocktail attended by the speakers each day, authorities, exhibitors and VIP guests. These meetings and those booked by participants will take place in the afternoon. “Building close relationships is essential in business, which is why our networking programme, with private cocktails and B2Bs, is so important, as well as the gala dinner and FINE Awards ceremony,” says Sergio Alart. 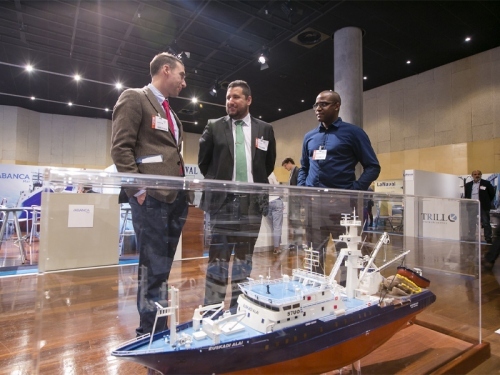 World Maritime Week began in 2017 to join international forces from four events in the sector: Sinaval, Eurofishing, FuturePort and Marine Energy Week. This brought about a unique event in Europe in one of the most important sectors for the European economy. The so-called "blue economy" handles around 275 billion euros in the EU. 117 speakers attended the first edition (50% of whom were international), as well as 78 direct exhibitors, and there were 425 B2B meetings.